How can I import my contacts into Streamtime? Import multiple contact records into Streamtime Classic using this article. 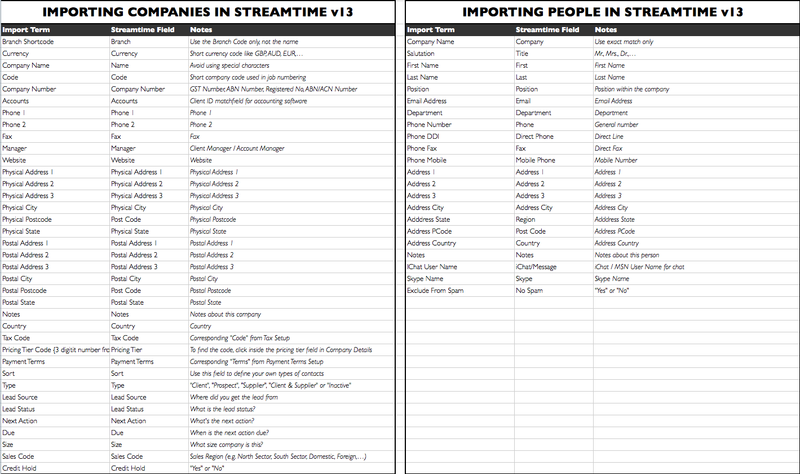 In Streamtime 13v4 and above, we've introduced the ability to import Companies and People. We support the import of CSV, Tab Separated, Excel and other common file types. Please Note: you must import your companies first and then people in order for the correct links to be generated. The import will be done via the client machine logged into Streamtime. Import the Companies and Company Details. This is done in the Companies tab. Import the People associated with Companies imported in Step 1. This is done in the People tab. While you can import files containing a wide variety of contact information, we have two template files with matching Streamtime names to make importing Contacts easy. Click here to download a Zip file containing two Microsoft Excel Streamtime templates. One for Companies, and one for People. The following Step by Step guide will take you through the process. Note: Streamtime requires the Administrator's password (if enabled) to import Contacts. This video overview is a good one to watch before you get started too. In my examples above, I have a list of Companies, address details etc. in one spreadsheet, and another spreadsheet containing a list of people who are contacts at these companies. As you can see, there are multiple people per Company in spreadsheet two. Streamtime will match the People to their respective Companies once you have imported the Companies from the first spreadsheet. Hint: When importing in the Companies tab, make sure that the Company name is unique to avoid duplicates. Streamtime will alert you after importing duplicates, mark them and allow you to delete or view these records. This window allows you to match the data fields from your spreadsheet file to Streamtime. If you've named the column headings in your import file, click 'Don't import first record (contains field names)' so you don't end up with a Contact called 'Company Name'. If you've used our template or the field names are the same in the import file and Streamtime, then select Arrange by 'matching names'. Additional target fields can be moved to match the source fields by clicking and dragging. Take note of the arrows for each matched field indicating if this item is to be imported or not, in the Field Mapping. Use the arrows to move through the Field Names to verify the correct names and address details are corresponding to the source and targets fields. When you're satisfied that your imported data is going to match the Streamtime data, click Import. Note: If things don't go as planned during the import and you notice a mistake, you can delete the imported Companies and try again. Click OK on the Import Summary. Streamtime will now show a list of the imported Companies. Unless you have specified otherwise, Streamtime will assign the new Companies to the default (home) Branch, Currency, Payment Terms, and Client Type = Prospect. In my example, I specified Client Type = Client, so this was included in my import, and you could specify Client, and Supplier in the one import if required. After the import, if there are any Company names imported that match existing names, Streamtime will give you the option of deleting them, or tagging them as 'Duplicate' to sort out later. We recommend deleting duplicates for obvious reasons, and Streamtime will only identify exact duplicates at this stage. If you make a mistake with the import and wish to delete the companies you've just imported, select the FileMaker Menu > Companies tab and select 'Delete All Found'. Enter the Streamtime Administrator password and click 'OK'. This will ONLY delete all imported Companies in this list that have NOT been modified after they were imported. If you attempt to delete lists of Companies that have been edited, or any pre-existing Companies, you will see this message. Companies can be deleted individually from the Company Details view. Note: The Delete All Found will delete Companies in this list that have been imported and not had any modifications to company name and address details only (not jobs or quotes etc). It is technically possible to delete an imported company that has jobs and quotes linked to it if the Company details have not been modified, so be very careful when using this command. There is no undo other than reverting to a backup. The most common scenario for using this command is immediately deleting a list of imported companies and you realise there has been a mistake. Streamtime identifies Contacts created by our Import function as 'Created by Imported', and shows the date of the import. If you need to find one or more of these Contacts, go to the Contacts > Detail View and select 'Find'. Then type 'Imported' in the Created By field, and hit enter. Add a Created Date to this search to find imports done on specific days, if required. Now we're going to import People into the Contacts area. In the import file, if there are Companies that match existing Streamtime companies, then Streamtime will assign the names of the people associated with each company automatically. This window allows you to match the data fields from your import spreadsheet file to Streamtime. Make sure you've selected to match the Company Name to the source Company name field. Streamtime will use this to match the imported People as contacts for each company. Use the arrows to move through the Field Names to verify the correct names and address details are corresponding to the source and targets. In the example above, you can see the details are matching the import fields. Click 'OK' in the Import Options Screen. Click 'OK' to the summary screen with shows the number of records imported. Note: If things don't go as planned after the import and you notice a mistake, you can delete the imported People and try again. Streamtime will now display the list of imported People. Note in my example that multiple People are imported for each Company. To find contacts imported into Streamtime, do a search in the Person Detail view and type 'Imported' in the 'Created By' field. Enter a date if required, and click Enter. Streamtime will search and display all People imported into Streamtime on this date. There may be cases where you need to delete duplicate or incorrect lists of People. This process is identical to the Company - Delete All Found (steps above). Note: The Delete All Found will delete People in this list that have been imported and not had any modifications to name and address details only, so be very careful when using this command. There is no undo other than reverting to a backup. The most common scenario for using this command is immediately deleting a list of imported People and you realise there has been a mistake in the field mapping.